Sunrisers Hyderabad’s (SRH) opener David Warner continues to be the leading run scorer of the IPL 2019. The SRH opener has scored 517 runs from nine matches thus far. Sunrisers Hyderabad's Jonny Bairstow is on number two with 424 runs in his kitty. Kings XI Punjab’s (KXIP) Chris Gayle stands on number three with 421 runs. Kings XI Punjab’s (KXIP) KL Rahul is at the fourth spot with 399 runs in the IPL 2019. Kolkata Knight Riders' Andre Russell stands on number five with 392 runs. IPL 2019 Points Table Updated. 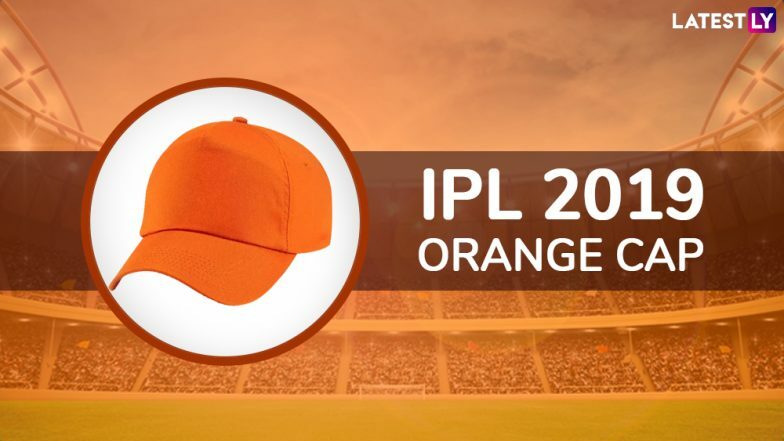 The batsman with most runs throughout the IPL 2019 will be awarded an Orange Cap to signify for becoming the leading run-scoring batsman at the end of the season. Past Orange Cap winners have been - Kane Williamson of Sunrisers Hyderabad for scoring 735 runs in 17 matches in IPL 2018; David Warner of SRH with 641 runs in 14 matches in IPL 2017; Virat Kohli of Royal Challengers Bangalore scoring 973 runs in 16 matches of IPL 2016. Here's the complete list of past Orange Cap winners are: David Warner of SRH for scoring 562 runs in 14 matches of IPL 2015; Robin Uthappa of KKR for scoring 660 runs in 16 matches of IPL 2014; Michael Hussey of Chennai Super Kings for scoring 733 runs in 16 matches of IPL 2013; Chris Gayle of RCB for scoring 733 runs in 15 matches of IPL 2012; Chris Gayle of RCB for scoring 608 runs in 12 matches of IPL 2011; Sachin Tendulkar of MI for scoring 618 runs in 15 matches of 2010; Matthew Hayden of CSK for scoring 572 runs in 12 matches of IPL 2019 and Shaun Marsh of KXIP for scoring 616 runs in 11 matches of IPL 2008. Indian Premier League (IPL) tournament has always been a batsman paradise. We witness some amazing batting performance in this T20 league tournament, where the batsmen make quick half-centuries and hundreds. Different star emerges out of each season of Indian Premier League; we can't easily predict the orange cap holder in any of the IPL. IPL 2019 Schedule in PDF: Download VIVO Indian Premier League 12 Full Timetable With Fixtures, Matches, Team and Venue Details. With in-form players like Chris Gayle and Rishabh Pant, who was the second highest run scorer, in IPL season 11, this year’s is expected to be full of extravagant action. As far as the orange cap is concerned, this will pass through many players, and the final holder will only be discovered at the end of the tournament. A total number of 60 matches including qualifiers, eliminator and final will be played in a span of two months. Who will be the Orange Cap holder in IPL 2019? Well, keep following the updated highest run-scorer list here for the next two months to figure out the next name!